technology. During this procedure, it's quite eco-friendly. And Modal as sustainable fabric, can be bio-degradable. Modal fiber's strength is better than viscose; much softer and easier to be dyed than cotton, also, modal's ability of absorption is outstanding. The yarn of Modal fiber could be in good evenness and could be blended with other materials in different ratios, such as wool, cotton, linen, and so on. 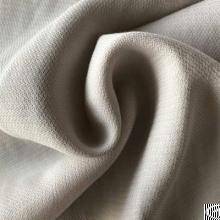 On the other hand, Modal fiber could interweave with cotton, linen, silk and to improve the fabric quality. Knitting Modal is mainly making underwear, but as Modal has a silver sheen, and easy to dye with glossiness, Modal fabrics are more and more selected to make outerwear.Modal fiber combines the luxury of organic fabric and practicability of synthetic fabric together, contains advantages such as the softness of cotton, the glossiness of silk and the smoothness of linen, what's more, it's breathable and colorful after dyed, less likely to fade as a result of friction.The ability of absorption of Modal is 50% higher than cotton, this performance makes Modal keep dry and quite breathable, it is ideal for making underwear and makes human body comfortable and health. Modal is also resistance to shrinkage, it has better stability and construction than cotton, and after several washes, Modal still keep fresh glossiness and much softer, while, pure cotton fabric fade its color and become yellow appearance.Modal fiber can meet ECO-Tex standard, and non-toxic to the human body. Thanks to Modal fibers, which hug our body in a touch of lightness, have become a reality.We strive to maintain and create more fashion and premium fabric, to satisfy our customers' personalized demand. Different styles with stable qualities of Modal fabrics will always in stock.